The vision for a sister community for Aviemore at An Camas Mòr, with a Park linking the villages, came from Aviemore and Vicinity Community Council in 1987 who have supported it ever since. 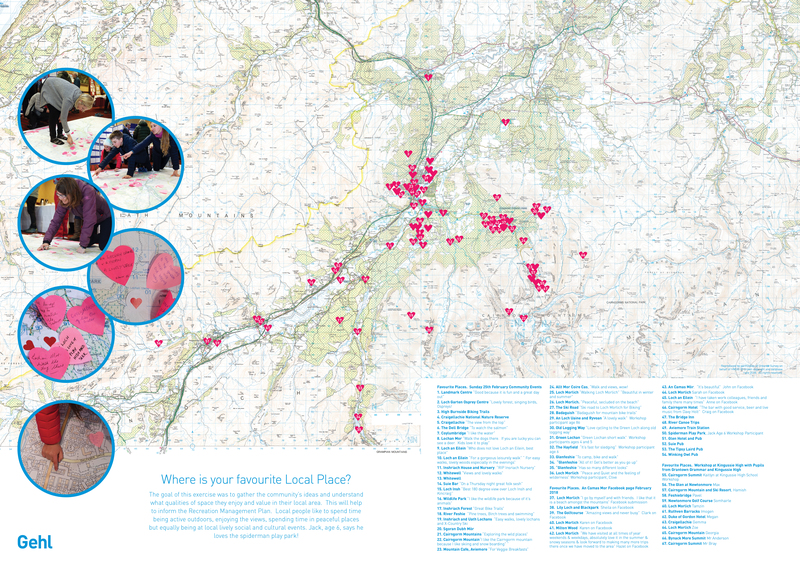 The community wish to bring The River Spey to the centre of Aviemore, place new sports facilities at the heart of community life and enrich Aviemore’s reputation as a centre of sporting excellence. Facilities for the elderly and childcare facilities are both vital. Collaboration of different people and ages. Somewhere people can get together and support each other’. The Masterplan for An Camas Mòr is shaped by community-led workshops between 2005 and 2018 – going forward with the next stage of the design, there is still space for your wishes and ideas. Please read our Community Findings Report for more information. A community hub at An Camas Mòr is planned from the start, a café– and hopefully also a nursery at the earliest stages. Eventually, An Camas Mòr is planned to include a village hall, library, health centre, residential care home with a site for a small Kirk and graveyard or memorial garden. Having a community so tied to the woods, children will have the ability to learn about the nature around them, using their surrounding environment as a classroom. The hope is that children who grow up in An Camas Mòr will have the opportunity to become the next generation of guardians and stewards of the National Park. A site for a primary school at An Camas Mòr faces on to the School Square on the High-street and backs into the woods- to create a forest school. The Highland Council will decide when they build it. Accessible paths, play parks close to home, outdoor seating and allotments with space for children’s gardens should make An Camas Mòr a place where all ages can enjoy healthy lives. Sheltered housing, homes with granny flats and a nursing home (at a later phase) will include people at every phase of life, enabling people to up-size and downsize whilst staying rooted in their community. 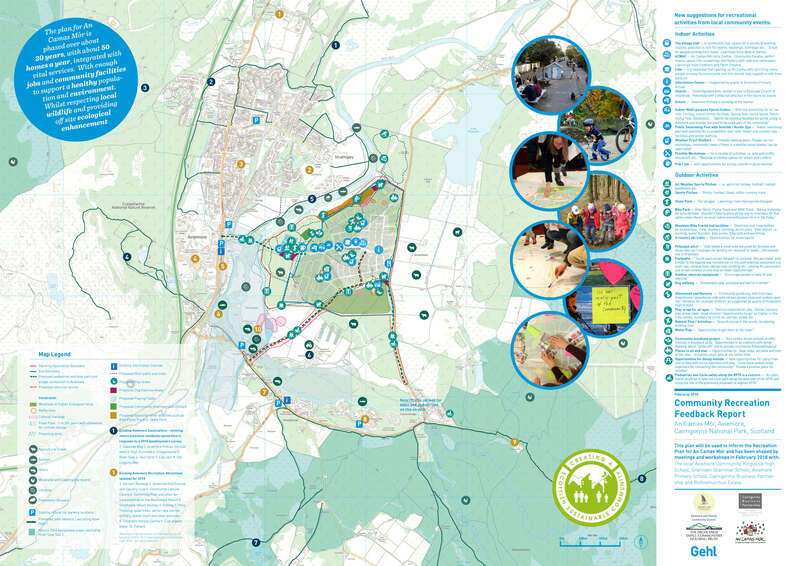 The Aviemore Countryside Park will bridge Aviemore with An Camas Mòr, eventually quite literally across the Spey and socially through sport with shared playing fields, allotments and a bike park for the enjoyment of both communities. There is a plot here for indoor sports at the community-led Aviemore Sports Centre Project. Life in An Camas Mòr is could enable and encourage an outdoor lifestyle. Participating in sports and recreation, accessing fresh air and physical activity, spending time outdoors in gardens and public spaces, and walking and cycling should be a natural part of people’s everyday lives. Older folk need more than a memorial park, keep them active for a healthy life.